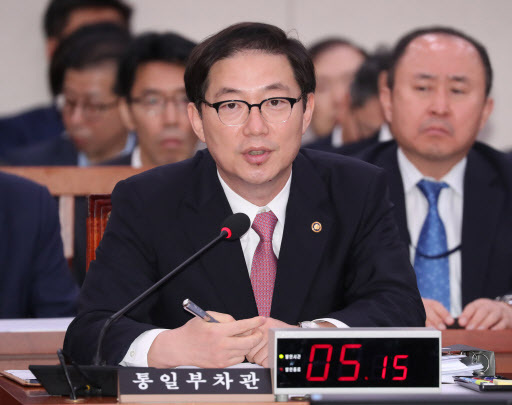 South Korea’s Vice Unification Minister Chun Hae-sung, the first co-head of the inter-Korean liaison office, vowed to contribute to advancing inter-Korean relations through round-the-clock communication with North Korea. The inter-Korean liaison office was officially launched in North Korea’s border town of Kaesong on Friday. It is expected to foster direct communication and exchanges between the two Koreas. “In addition to supporting the inter-Korean summit, the liaison office has an important task to assist (inter-Korean) cooperation and exchanges in the private sector,” Chun told reporters after he held the first meeting with his North Korean counterpart Jon Jong-su on Friday. The office is co-headed by Chun and Jon, vice chairman of North Korea’s Committee for Peaceful Reunification. The two will not be stationed there, but will meet every week, according to the Unification Ministry. The main task of the liaison office in the coming weeks will be to discuss follow-up measures to the inter-Korean summit planned for next week, Chun said. South Korean President Moon Jae-in and North Korean leader Kim Jong-un are set to hold their third summit from Tuesday to Thursday next week, with denuclearization and development of inter-Korean cooperation expected to top the agenda. Located in a four-story building in the now-shuttered Kaesong industrial park, the office will be in operation from 9 a.m. to 5 p.m. during the week, with some 30 officials from South Korea and some 20 from North Korea to be stationed there. It will be manned 24 hours, 365 days a year.